With the canopy behind me it was time to start doing smaller things that would bring it all together. 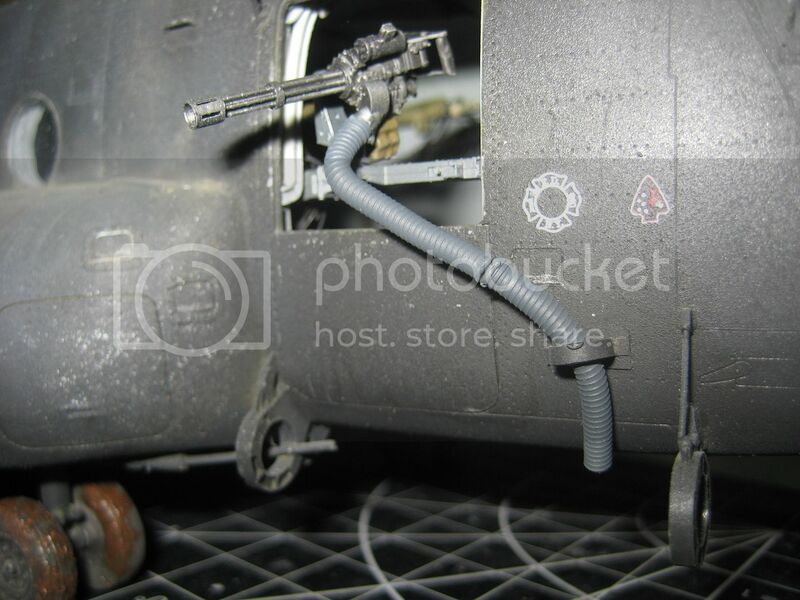 I felt that I had two big hurdles left before painting, the in-flight refueling boom and the hoist. I figured I could work on the In-flight refueling boom relatively quickly. 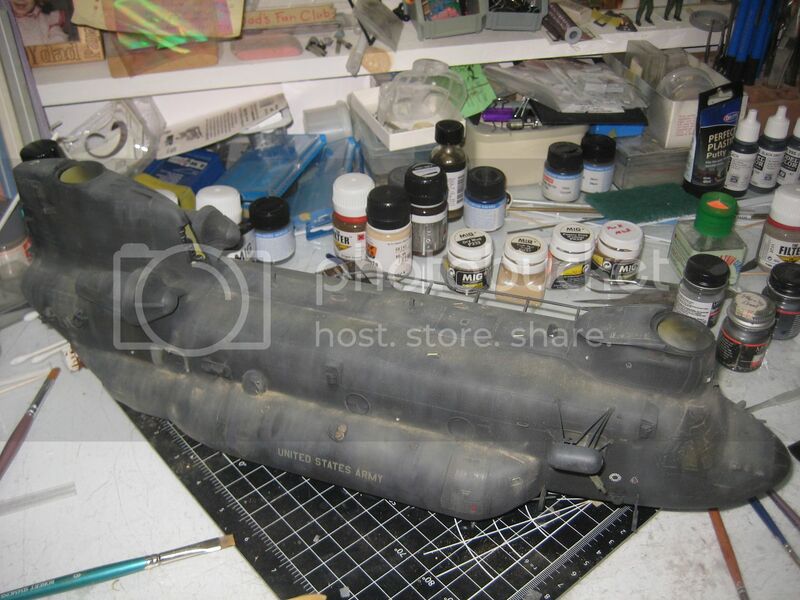 I used the supplied aft portion of the conversion and the tube provided. The fit was perfect. Now how to get it attached to the fuselage? 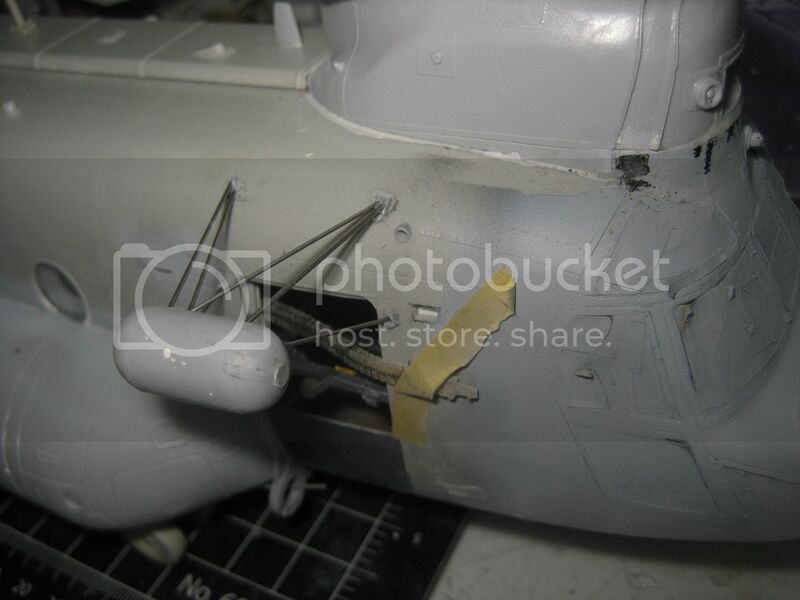 Utilizing the parts provided in the conversion I added the fuselage attachment points. This was a non-issue. The mounts slip onto the tube easily so I moved them to the approximate points. There are four mounts on the front boom mount. I figured out that the two middle ones next to the fuselage would work just fine if I sanded the mounts to allow them to wedge together with the ones on the tubing. This served two purposes, the first, and most important, is that the mount is secure and, secondly, in turn provides the alignment of the tube. I did scratch build some things for the tube. 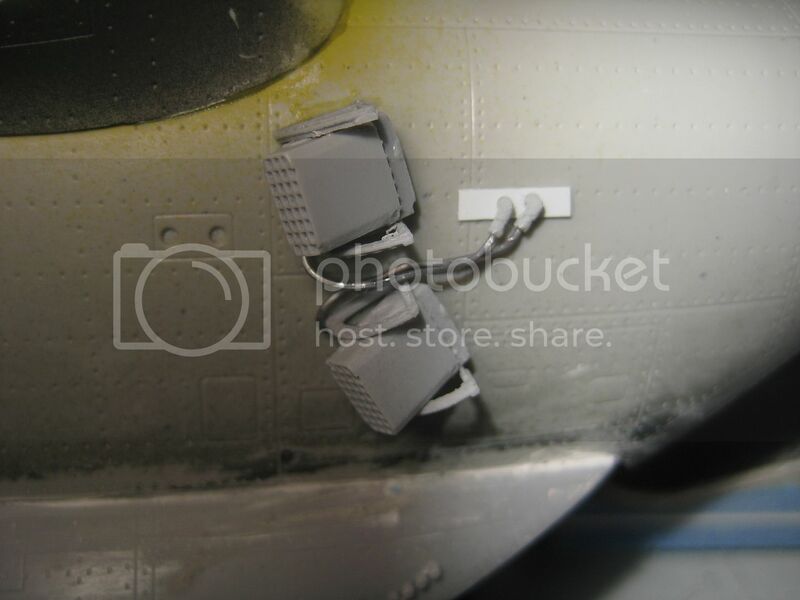 I used piano wire that slipped into the aft mount, some styrene and Model Car Garage fittings to add the supply hose. 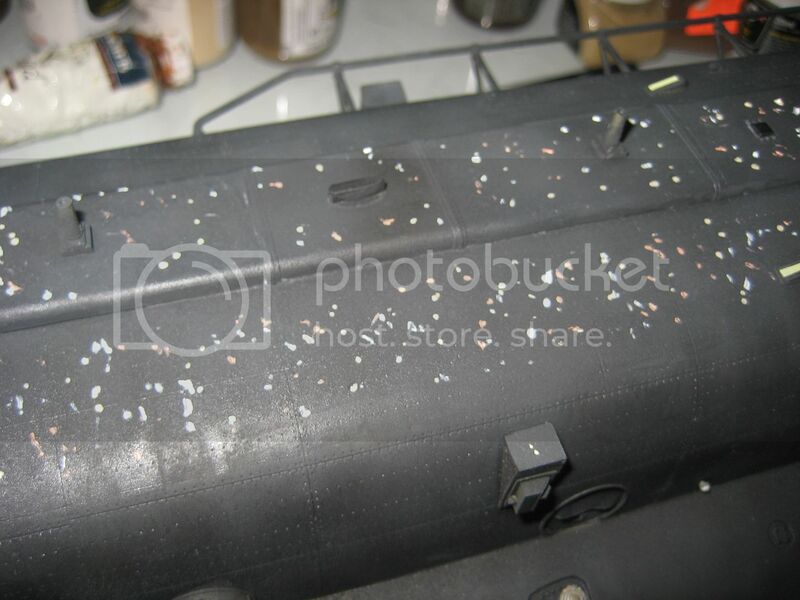 A hole was drilled into the fuel tank for the piano wire to slide into. With that, surprisingly the in-flight refueling probe was done. 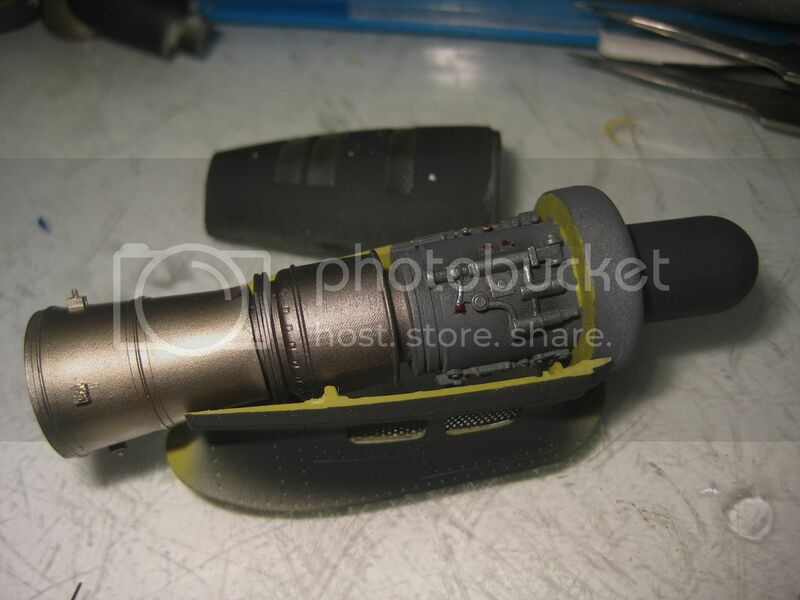 I removed the tubing to be inserted later prior to painting. Well it was done until I broke the mount off while handling the model. Then it was go through the process again. Such is model building. I thought now was the time to add the top of the front pylon. 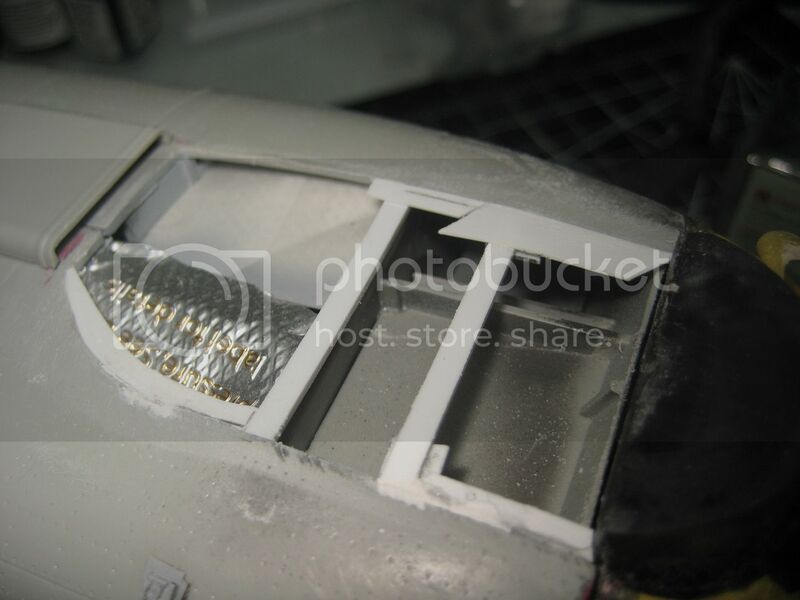 The front pylon required a little bit of styrene to fill the area around the edge of the cutout that I did early in the construction. It was easy enough to do just cut styrene to shape and attach with liquid cement. 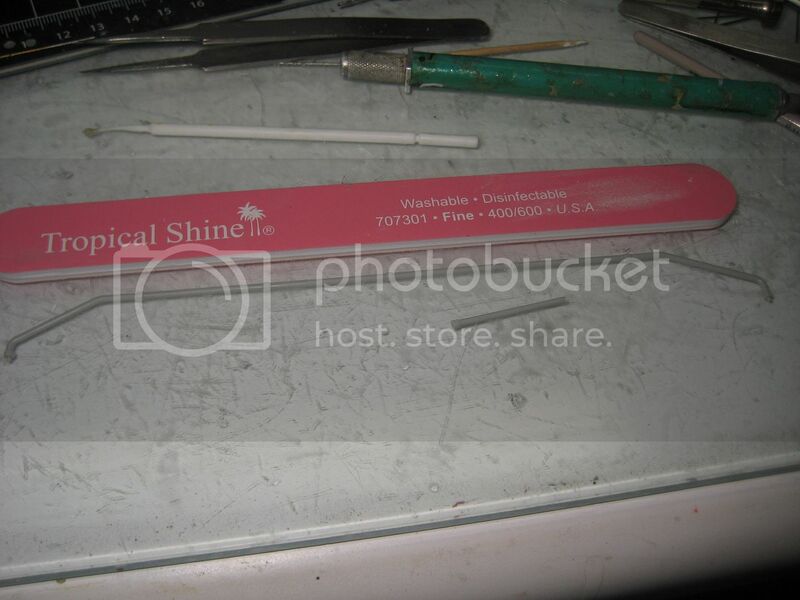 This provides a stable mount for the resin part. Test fitting the driveshaft cover showed me that I needed to add some styrene to the aft part of the resin pylon. 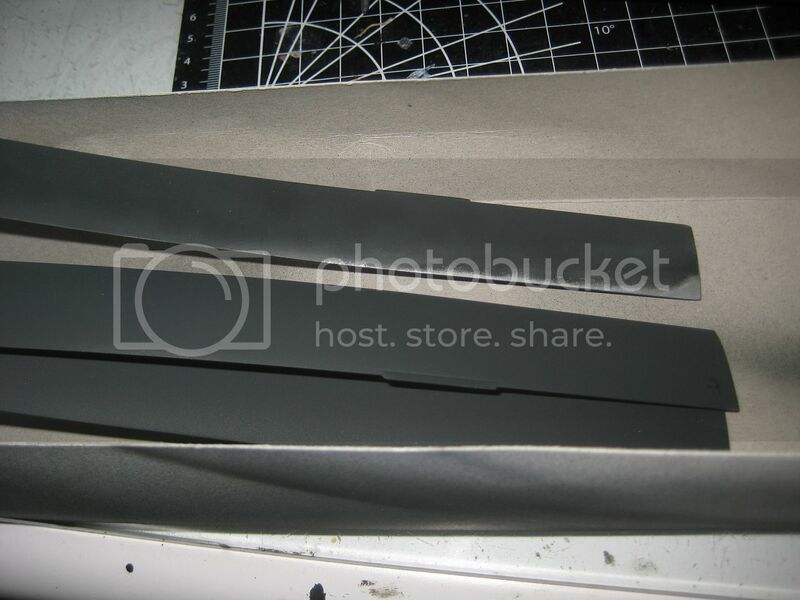 Nothing drastic just cut a piece of styrene and glue it in place. Once set it was sanded to shape. With the canopy in place it was now time to fair the upper pylon onto the area. This was done with super glue and Apoxy Sculpt. The area was faired in just like any other part. Apoxy Sculpt, superglue, putty and Mr. Surfacer. I wanted the FLIR to be a nice addition to the belly. I thought it was a little simplistic so I added some connectors and wiring to ‘attach’ it to the aircraft. The last really big event was going to be the hoist. Would I be able to put it on and keep is secure. I used .6mm needles and held the hoist in the approximate position in relationship to the mounts that I added early in the build. Then I poked the point into the hoist. This provided a pilot hole for drilling the hole. Then it was just a matter of getting the bottom two mounts to work first to support the weight of the hoist and then the others were easy. The bottom mounts are actually 38 and 39 inches long and 1¾ diameter. I found the needles worked well in allowing two, and sometimes three, rods fitting on the same mount. Surprisingly, the hoist is very robust. It would still need to be ‘plumbed’ but that would be later. 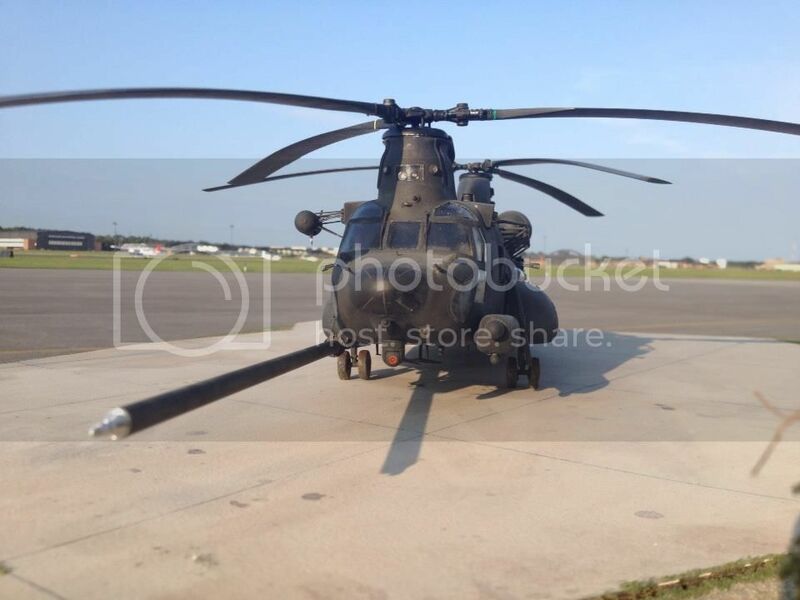 One of the salient features of the MH-47 is the myriad of Chaff/Flare buckets along the sides. I did have to scratch build the dual mounts, but the two separate launchers have resin mounts supplied. Building the flare mounts is really simple and mounting them is just as simple. I added the connectors and the wiring. Overall they look very effective. The engines would be basically hidden inside the nacelles with just a hint of the metallic burner can showing through. Because of this I did not add a lot of detail to them. I did make diffuser tubes for the back end. 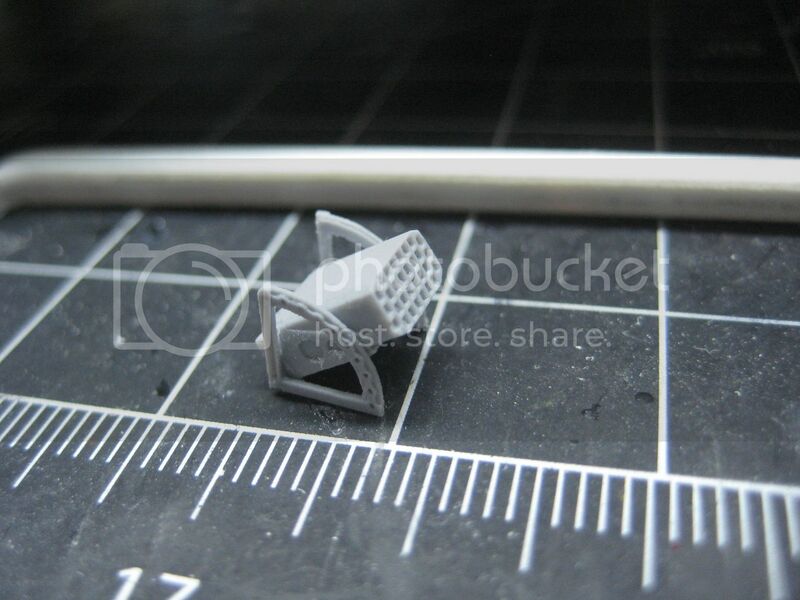 These were just ¼ inch aluminum tubing with holes drilled for the mounts through them. These mounts also had to fit in through the exhaust nozzle. Nothing too big. Some stiffeners were added to the mounts on the outside. The results were very convincing. 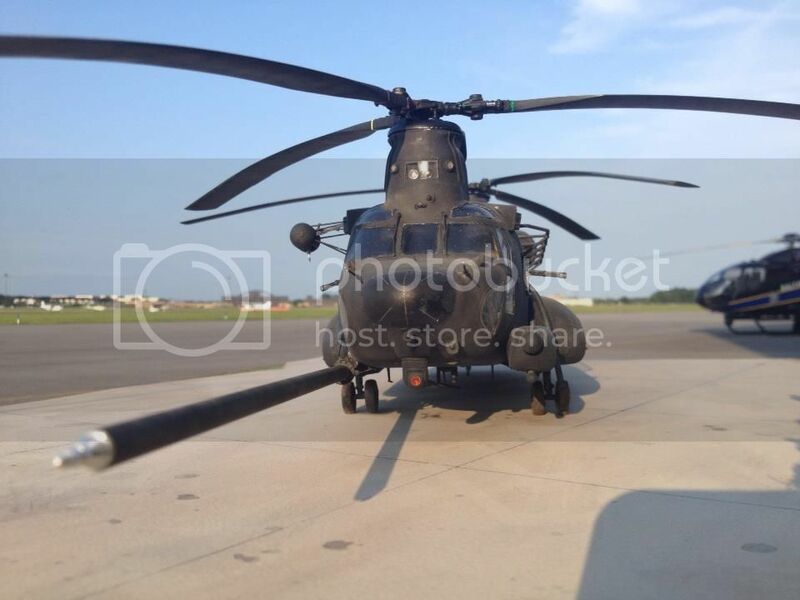 The HF antenna as molded in the kit is now too long for the MH-47E. Shortening it was easy. Just remove one section and then it was a matter of pinning and gluing the cut line for strength. Simple and invisible modification. It was time to get the whole thing masked up. I was initially regretting this but it turned out to be a non-event. 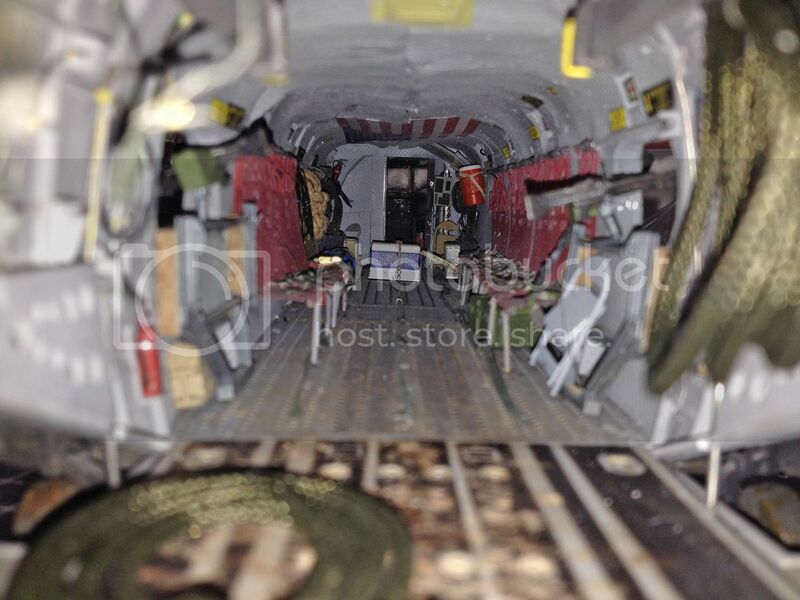 Wide Tape was added to the rear cabin opening. Then the rear windows were masked with tape in a conventional way. The front ones were supplemented with index cards cut to size to fill opening. Tape and some masking fluid held it in place. 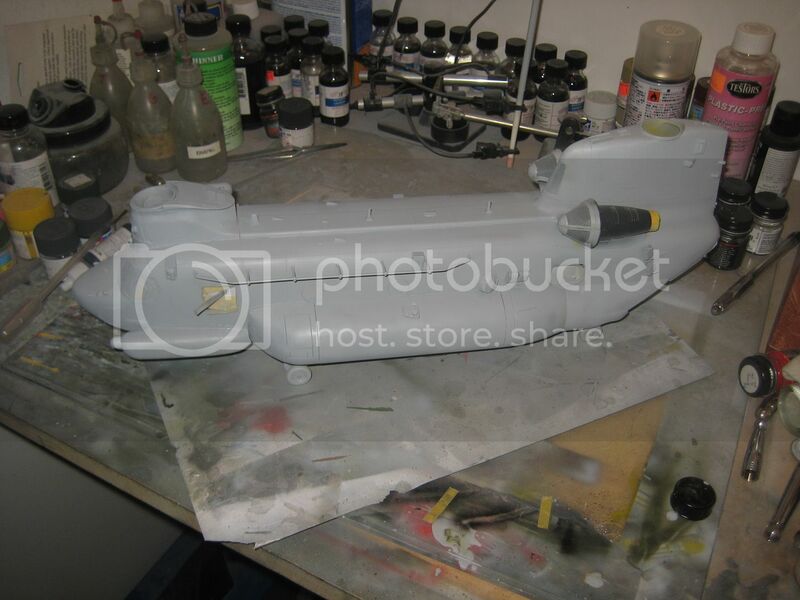 The whole model was then primed with Alclad Grey Primer and any areas were fixed that needed it. With the primer dried and everything fixed up it was time to add some color to this beast. 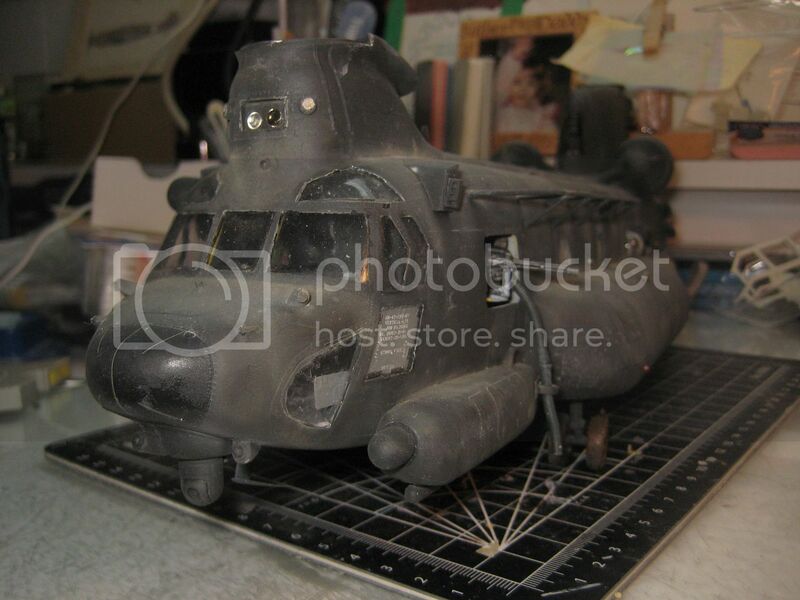 I like to add zinc chromate to my helicopters to bring out the realistic color and to aid in weathering. 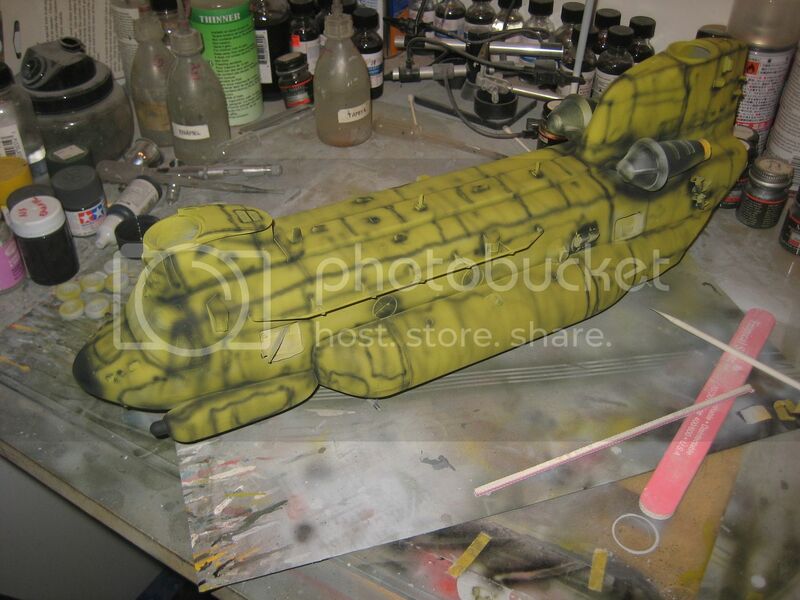 Some Tamiya Zinc Chromate was sprayed over the entire model and I had a yellow green machine on my bench. I then pre-shaded with Tamiya Flat Black. 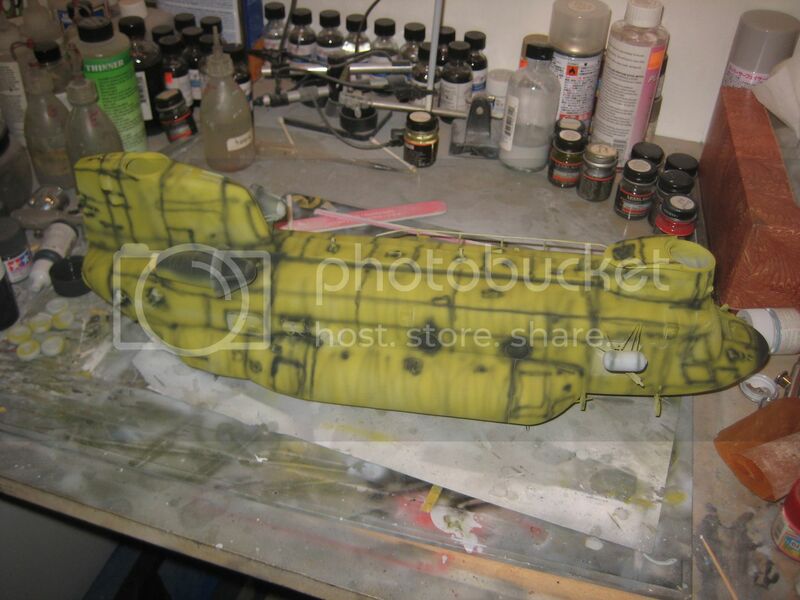 This was applied along the panel lines and in a random pattern that would barely show through but it is one more layer of weathering. The whole process was going very quick now. After some conversation with some Night Stalkers it appears that we were incorrect. Night Stalker aircraft are not Flat Black. Yup, you heard me right, they aren’t flat black. 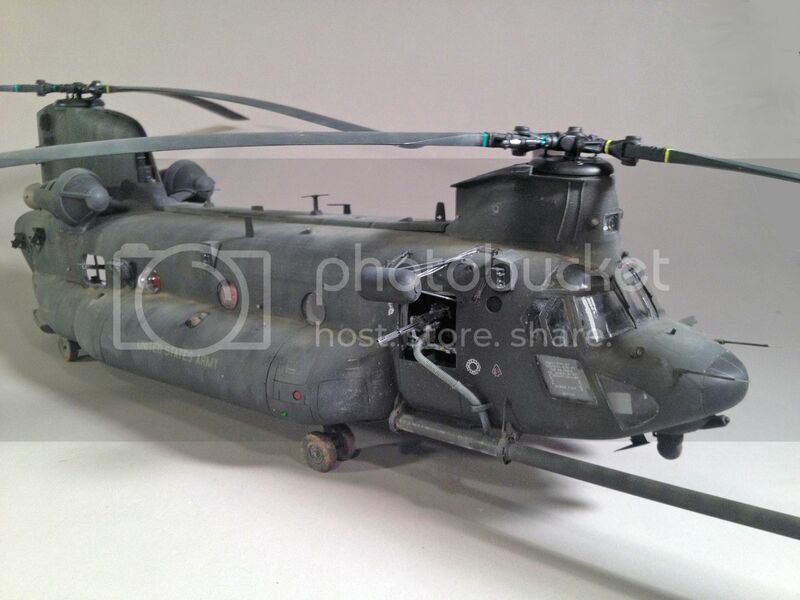 The correct color is a mix of two parts US Army Helicopter Green (FS34031) and one part Flat Black. I used Model Master Enamel for my mix. I mixed it up in acrylic and enamel so I could use the one for weathering. The color is still very dark. I applied the mix in vertical strokes to aid in the weathering. To the base coat I added some white to lighten up the color. 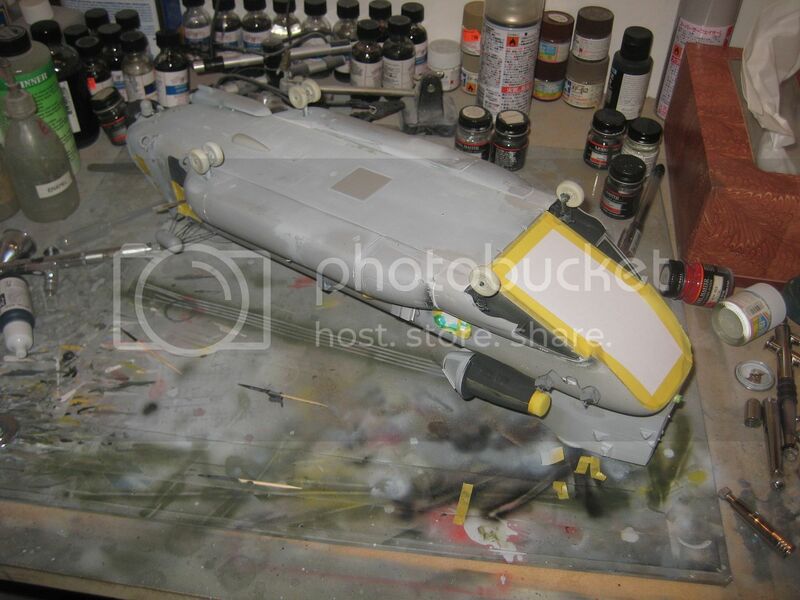 Again using vertical strokes with the airbrush adds another layer of weathering. I also used this mix on horizontal surfaces, such as the top of the pylon and fuel tanks, that would be bleached by the sun. 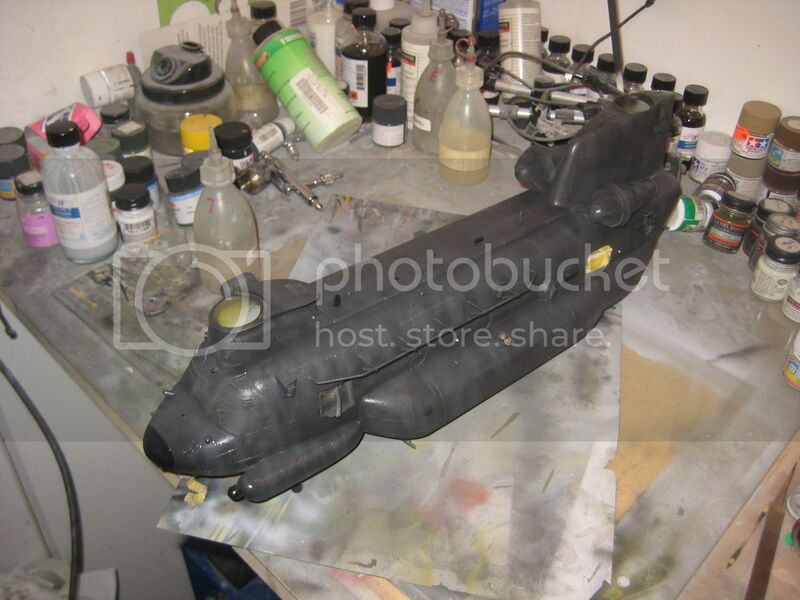 Some flat black was added to the nose cone and the weather radar. Once I was happy with the results I added a coat of Alclad Aqua Gloss, my favorite clear coat, in preparation for the decals. 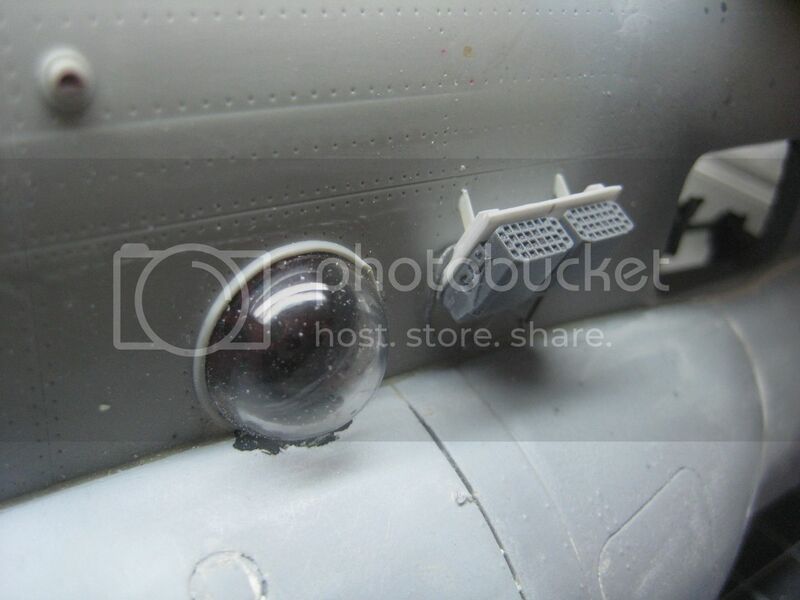 The decals are of course the Werner’s Wings Night Stalkers-Part 2 decals. They are really thin so make sure you have plenty of water on the surface to get them in place. 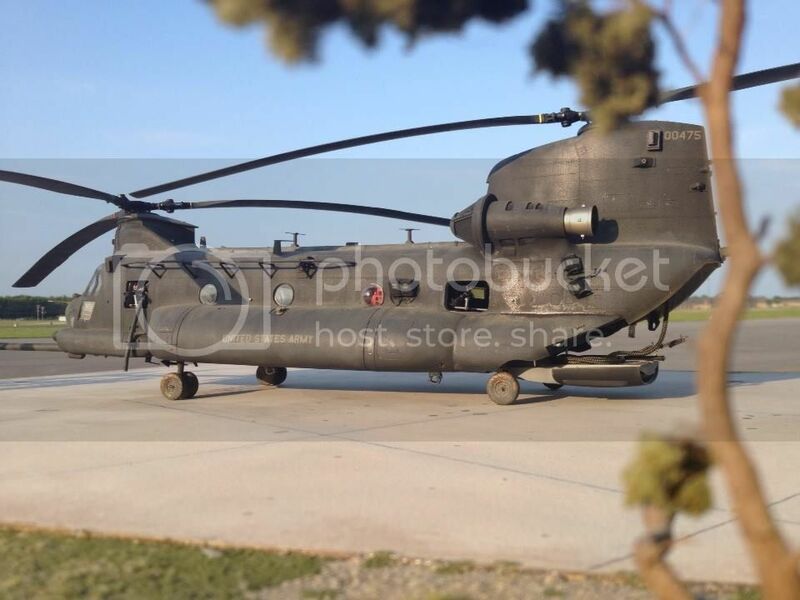 They posed no problem and there are just not a lot of decals on the MH-47. I did my aircraft as Razor 1 from “Robert’s Ridge” which featured a NYFD symbol, as well as, the arrowhead near the right front door. 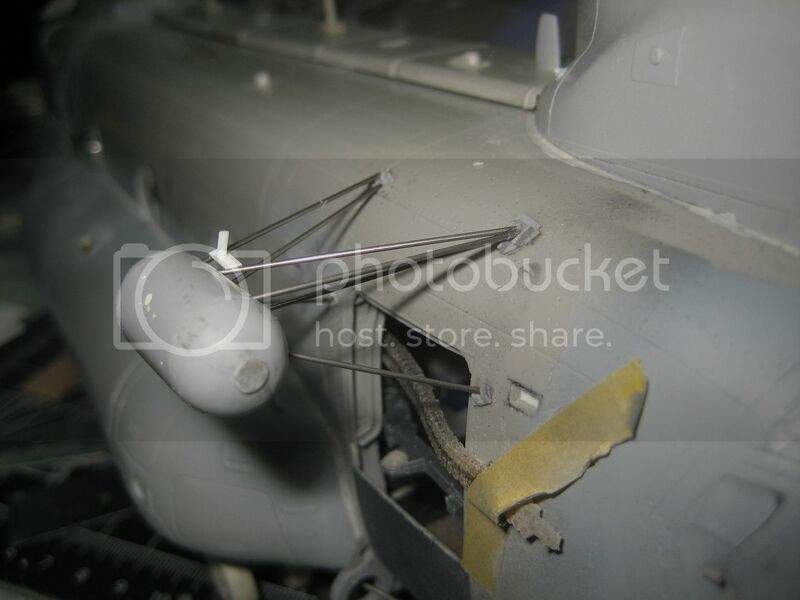 The decals were set in place with Solvaset and sealed with Alclad Flat. 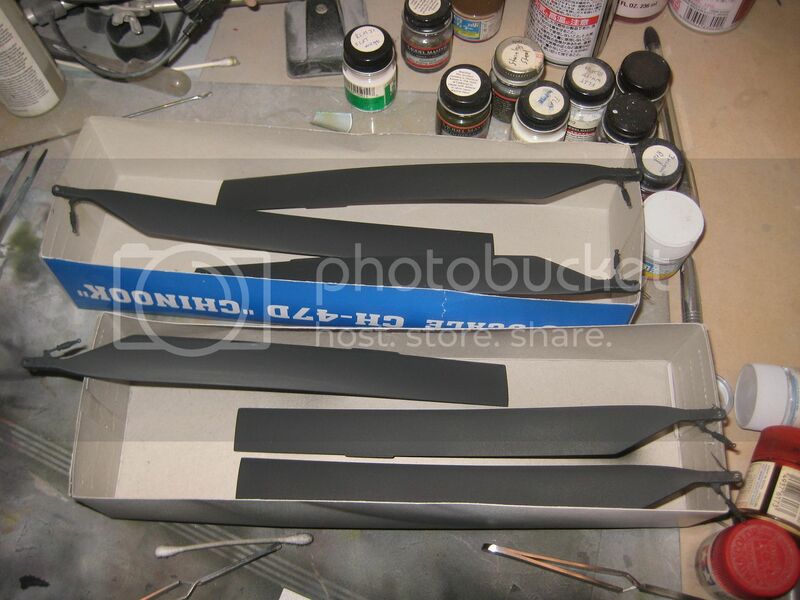 While the fuselage was drying I worked on the rotor blades. I cleaned up the ‘panel lines’ on the rotor blades as they are not on the real blades. I also removed the raised panel on the end of the blade because again it isn’t on the real thing. Rotor blades are smooth and pretty featureless despite what model manufacturers depict. I filled the panel lines with super glue and baby powder set with accelerator. Once that was done Alclad Grey Primer was applied then polished smooth. Then a coat of Alclad Stainless Steel was airbrushed over the blade. I did not add a coat of zinc on the blades as everything I saw in pics seemed to indicate that there was no zinc applied. I could be wrong. 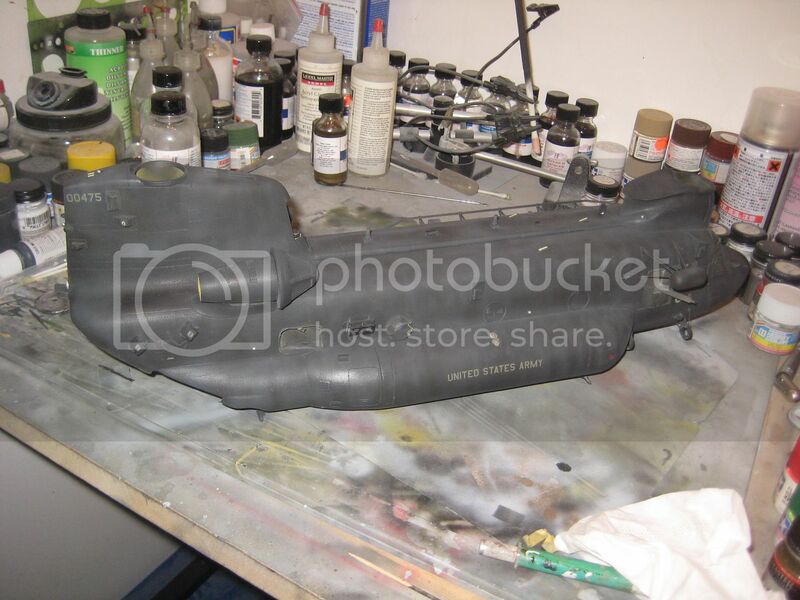 Anyhow when that was done I sprayed Tamiya NATO Black which is my go to black lately. It isn’t too dark and looks great. 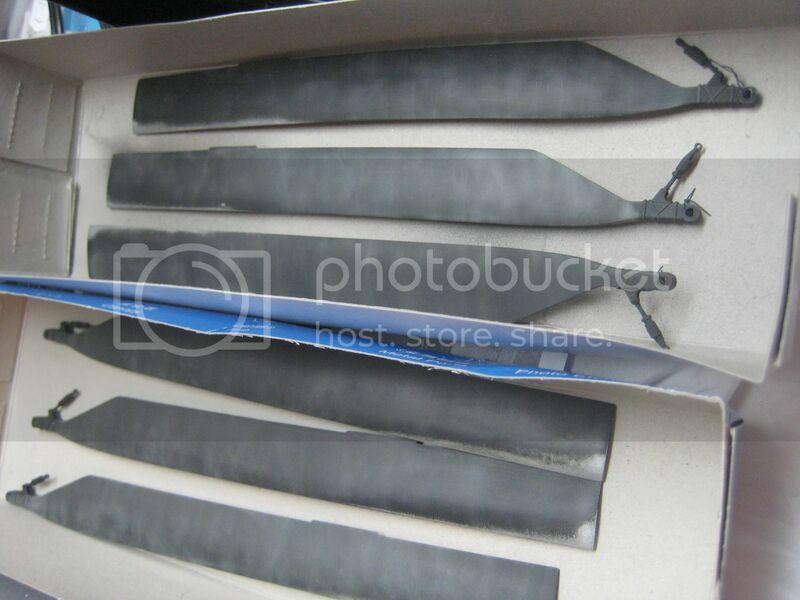 Once the paint was dried I used sponge sanding sticks, I can’t remember who makes them but they are beautiful for depicting wear on rotor blades. I work slowly from the tip to the rear this gives you a very realistic wear pattern. I touch up the front of the blade where I sanded through the paint with Model Master Steel applied with a sponge. The end result is quite realistic but the blades aren’t done yet. 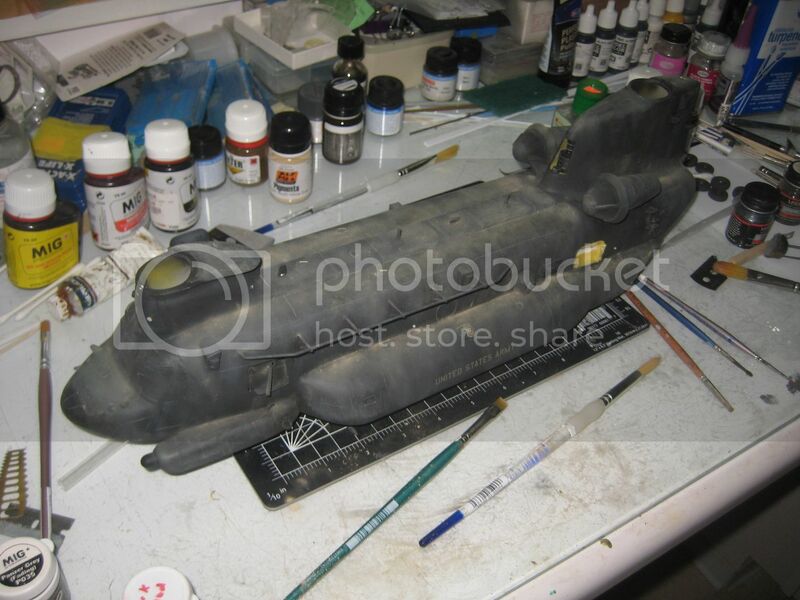 After that was applied, I used Tamiya weathering powders and streaked the blades from front to back. 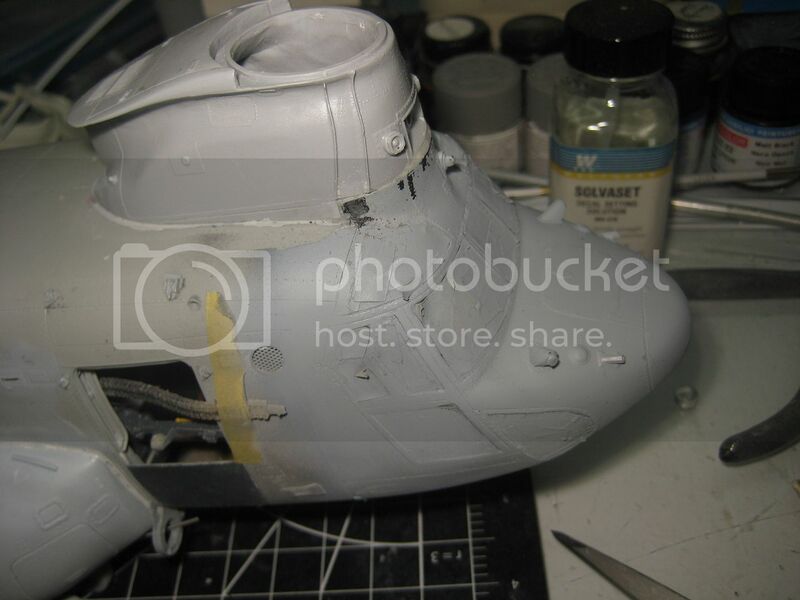 I did more weathering on top of the blades than the bottom just because they are exposed to the sun more. The final step was to thin out some Tamiya Buff so that it was very translucent and apply it in the direction of rotation. The blades were set aside for now. It was now time to dirty up the fuselage. Dots of white, buff, and some flesh artist oils were applied to the kit, more on the top than on the side or bottom. This was then blended with a damp brush in Turpenoid. I tended to blend in a vertical dimension as the flow of rain would ‘flow’ down the fuselage. I tried to do one panel at a time to make a random pattern. I was really happy with the results. 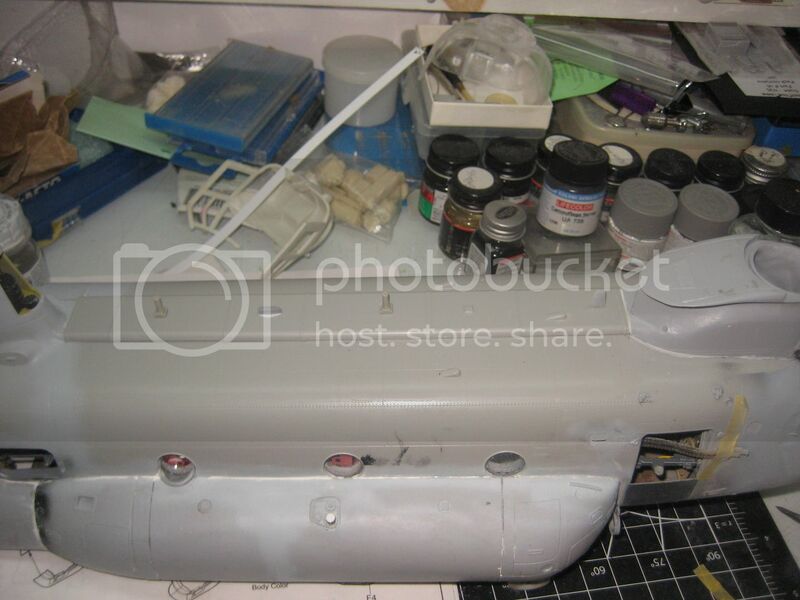 Now comes a part of the weathering that many aircraft modelers are not comfortable with, dust and dirt. I use Mig Pigments for this, Dust and Desert Sand to be specific. This was applied with a wide brush and allowed to build up in recessed areas and on horizontal surfaces. This made the model ‘attached’ to the Afghanistan terrain. 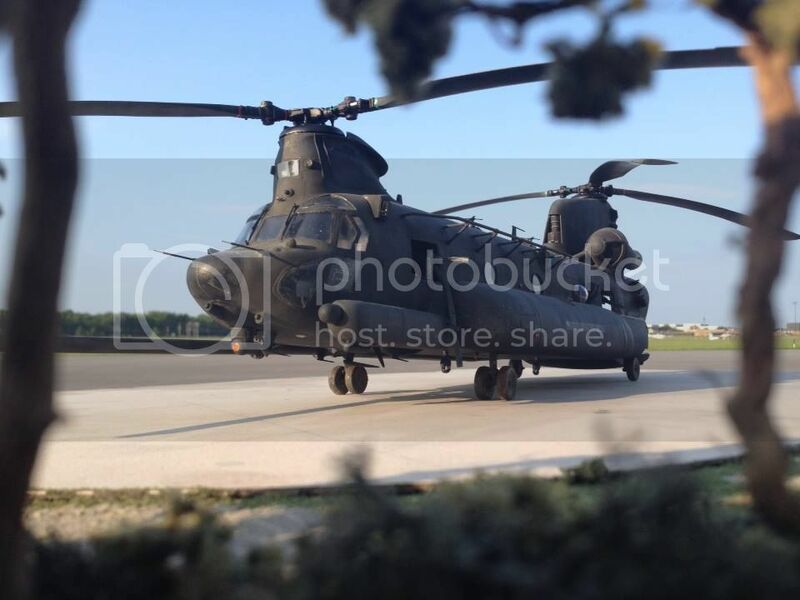 If you look at aircraft, especially Army aircraft, in a desert environment you have free reign on the amount of dirt you add. I thought I kind of went overboard so instead of freaking out I used some very thinned flat which tones down the dirt and seals it to the model. Razor 1 did not carry the M-240 machine guns but had M-60s. It also had a ramp mounted M-60D. Live Resin doesn’t make an M-60 yet so I went with a Dragon set for Vietnam weapons. It contained some really nice M-60s, including the D. It was just a moment of pinning them to the Live Resin mounts. It was easy to do and they look great. I was surprised at how well the plastic guns were. 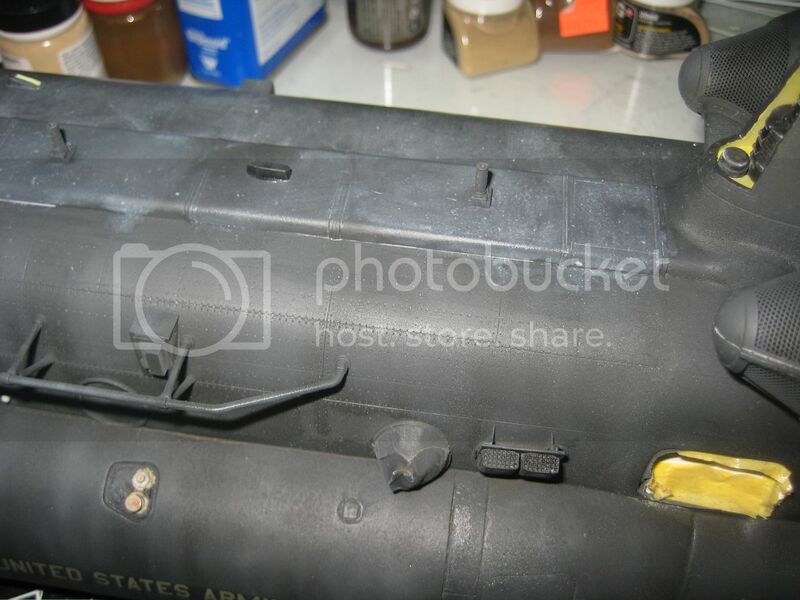 While I was doing armament I added the front M-134s and the tubing. 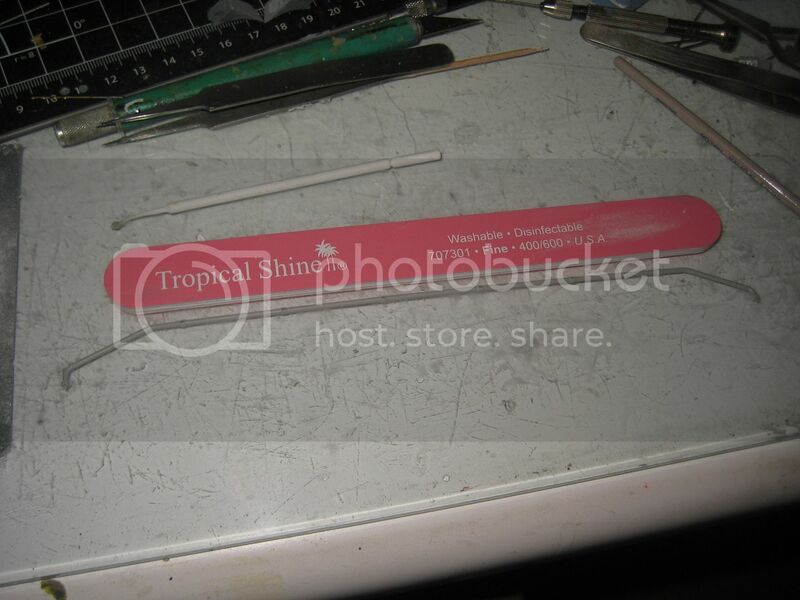 I had to scratchbuild the guide for the shell ejector chute. 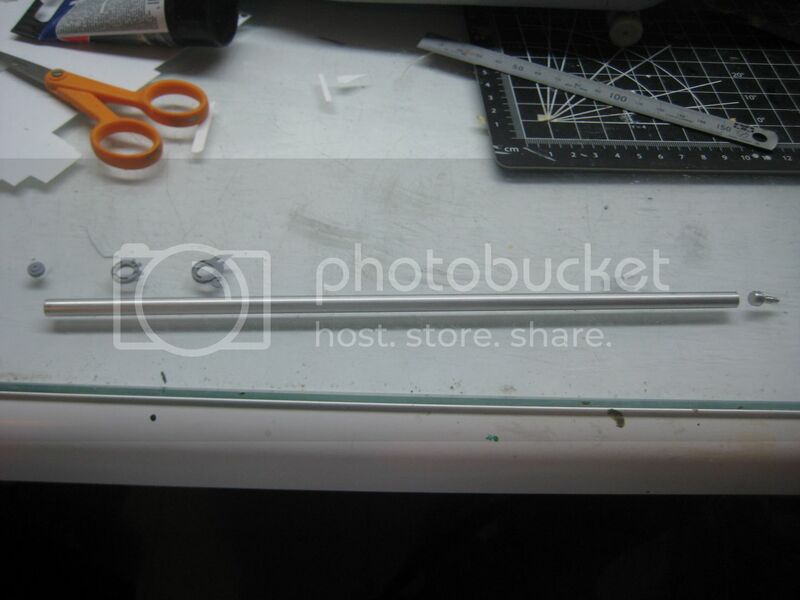 This was done with some ¼ inch tubing cut to size. The actual ammo chute and shell ejector chute presented a unique problem. They are solid resin, how do you get those big bends? I used an embossing heat gun which works faster than hot water. You have to be careful but it does allow you to get a lot of bends. I only heated the part away from the model then bent it to shape. It is a pain but the results worked out nicely. I start at the gun and worked my way down the tube. 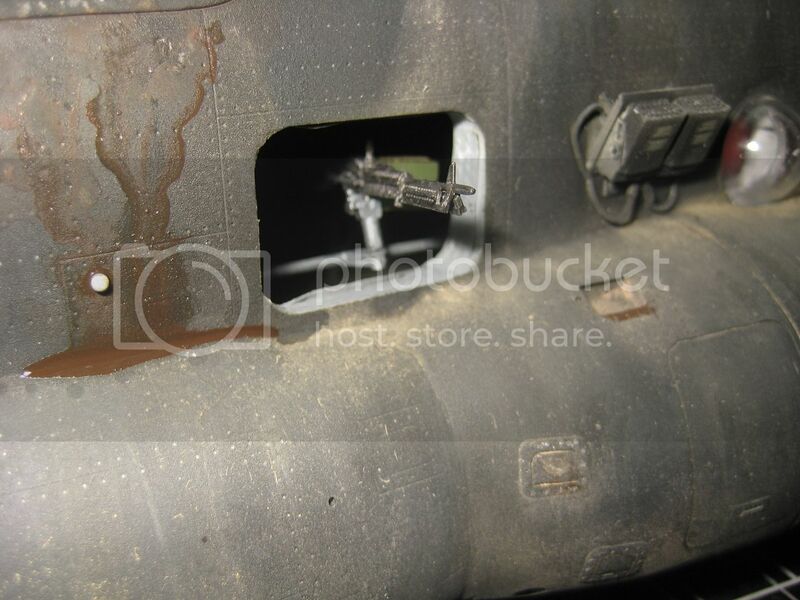 This is especially important because the right front gun has to go inside the refueling tube. When I got a section how I wanted it I wrapped that portion in tape and cool damp tissue which acts like a heat sink and preserves the previous bends. 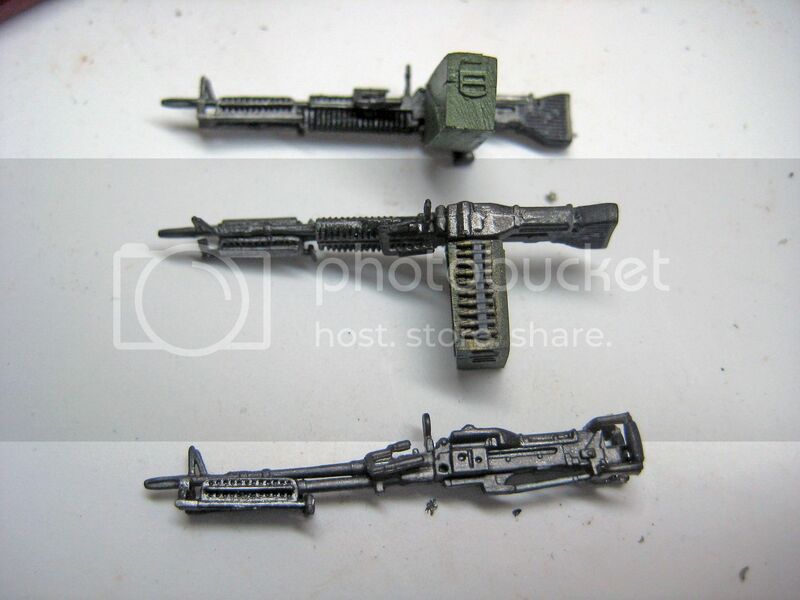 These were then added to the guns when I was happy. They had to be threaded through the guide and glued into place. The area under the engines are subjected to the oils and gas bath that is used to ‘wash’ the engine. I added some of Mig washes and oil. I added under the engine then added Mig thinner then let it flow with gravity like the real thing. This does a few things. First it makes for some unique color and it is shiny in contrast to the flat finish. While I was playing with the Mig stuff I added mud to the tires. 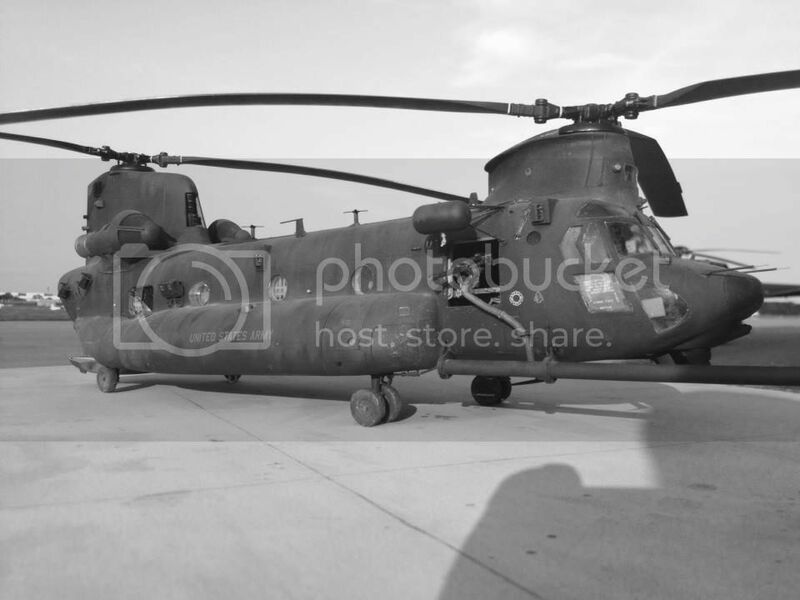 The aircraft operated the in the harsh desert environment of Bagram and then in the ice and snow of the peaks of Afghanistan. 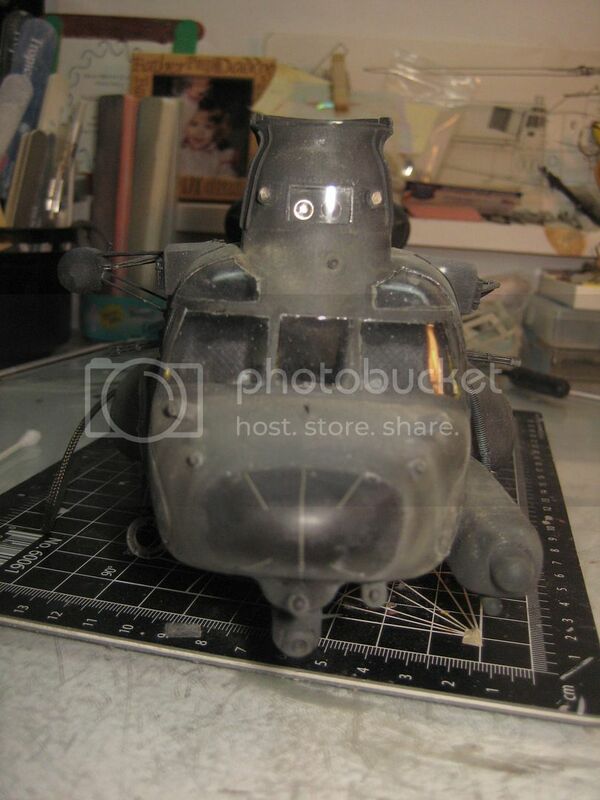 Now the helicopter was essentially done. I only had to add the ramp and the rotor heads. So I started to remove the tape from the canopy. It came off nicely and looked good….until I removed the tape from the chin bubbles. Lo and behold there was masking tape on the INSIDE of the bubbles. WTF? I’m so stupid. It was on both bubbles and a strip of tape inside the front windscreen. What to do? Rip off the canopy and reattach? Throw the model against the wall? Get the tape out somehow? I elected to go to bed and fretted over it all night. In the morning I decided to drill out the clear part and replace it. It sounded hard but actually wasn’t too bad. I initially was going to just use sheet plastic but didn’t like the way it looked. Since I’m the manufacturer I had some spare canopies that had flaws in them that I wouldn’t send out so I took one and drilled out the canopy. I worked them into position and was pleasantly surprised by how nice they turned out. The area around them did require touch up but it is hardly noticeable, except in the harshest light. After that near fiasco I built up ramp assembly. I was not happy that the ramp sits in the in-flight mode but I left it at that. It fits just fine and looks great. It was time to add the inflight refueling boom which was only slightly harder than it should have been. The boom fit fine when I test fit it. Of course that was before primer and paint. It eventually went on just fine though. I added some small final parts like the position lights, anti-collision light, hoist hook, pitot tubes, rear antenna array, and antennas on the spine. The finished fuselage was set aside for now while I worked on the rotor heads. These worked out just fine. 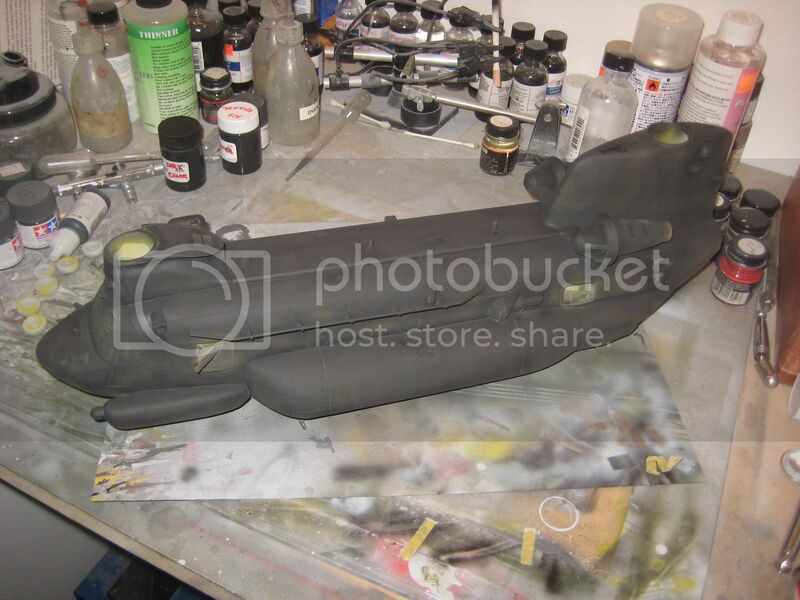 The assembly was painted Lifecolor Satin Black. 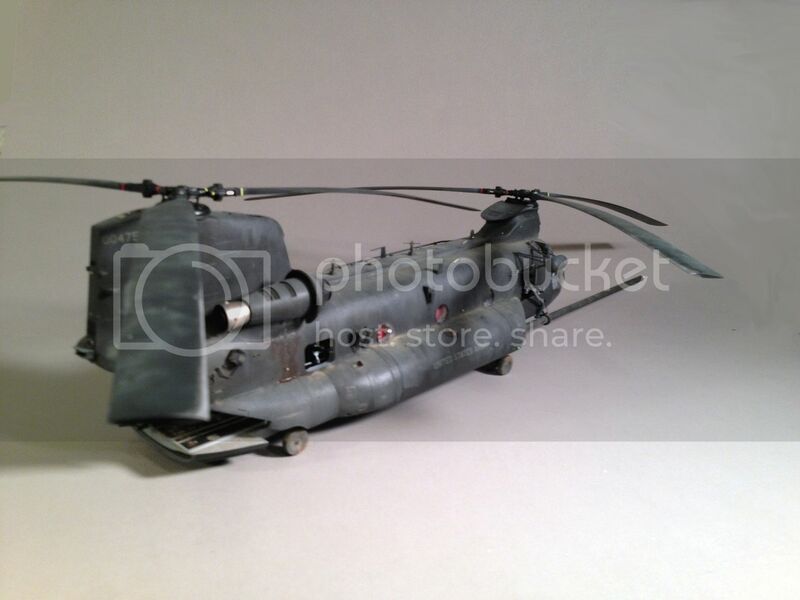 Decals were added to the blades for some color and the rotor were added to fuselage and remarkably the model was done. I sat back and admired my work. I was really glad that Andrey did the hard work to make this beast buildable. It is frackin huge, ugly and beautiful at the same time. Will I do it again? 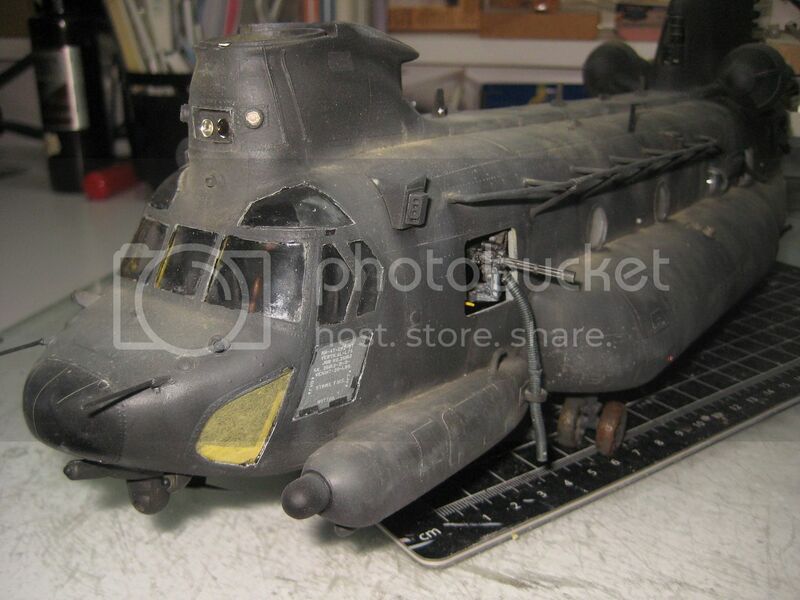 Well let’s just say I am working on releasing an MH-47G conversion set. I’d like to thank some people, not the least is, Andrey Bass from Storm Miniatures for entrusting me with finishing his baby up and releasing it to the market. 95% of the work you get in the conversion is his excellent work. Without him there was no way we would have this conversion. Then there is Norbert Jakob who helped out with CAD work for the flare/chaff dispensers and rear antennas. Mason Doupnik, as usual, made some great decals. He makes me look good. Live Resin was Johnnie on the spot with their armament sets just when I needed them. Black Ops for releasing the toolbox that I love, even though it is hidden inside the belly of the beast. Again this came at the exact time I needed it. Mark Rocca from NJ for providing me with some of the equipment inside the cabin. Thanks to Joseph Osborn of Fireball Modelworks for getting me the decals I needed until the Werner’s Wings ones were delivered. I’d also like to thank Chris Miller from the Cobra Company for his help with various parts of this model and technical advice. And finally I have to thank my wife, Yvonne, for allowing me to spend so much time in the model room. Without her understanding this model would still not be finished. You can’t ask for a better wife. -I would not ‘reupholster’ the insulation. -I would pin everything in place. 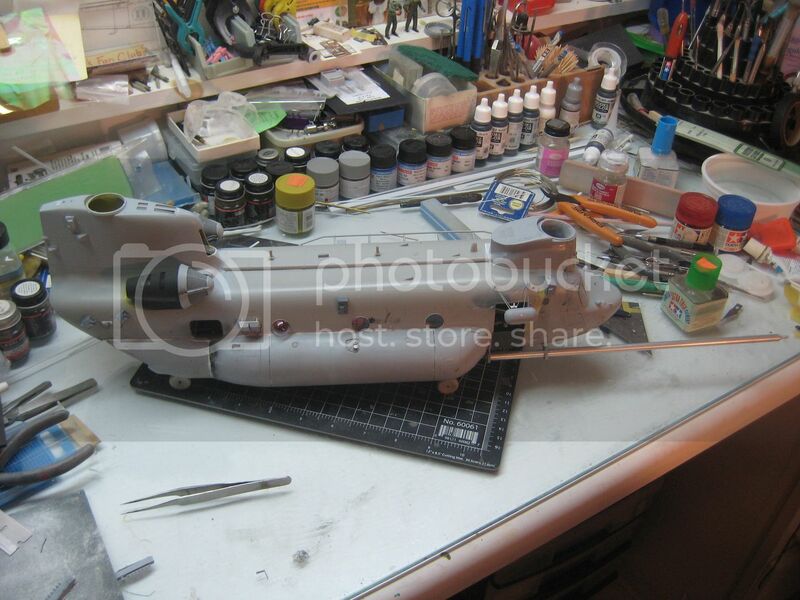 -I might like to cut the front canopy so that the resin upper and chin bubbles were used but all the others would be the kit parts. Dave Hoernle did this and it looks awesome. It was probably stressful but the end results were indisputable. -I would like the ramp to sit on the ground on the next one. 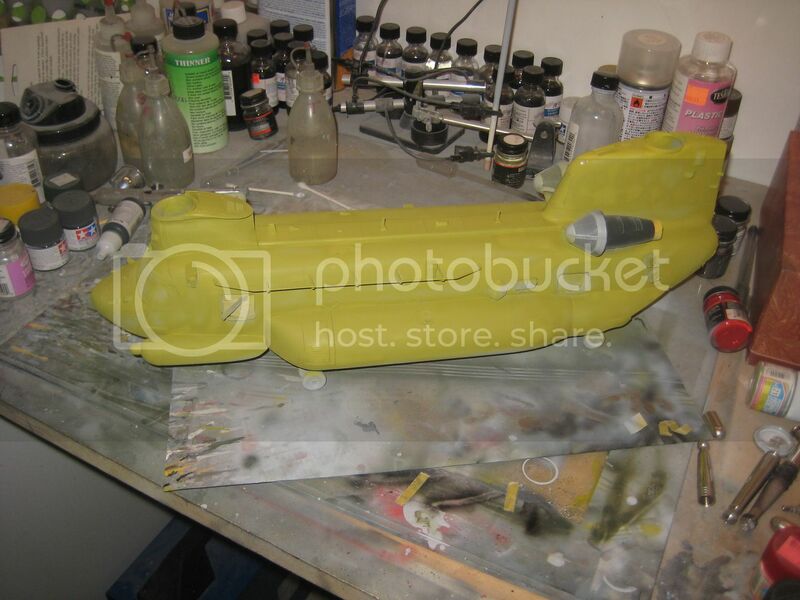 -I’d assemble the complete Live Resin sets BEFORE I closed up the fuselage. Not add the guns after. 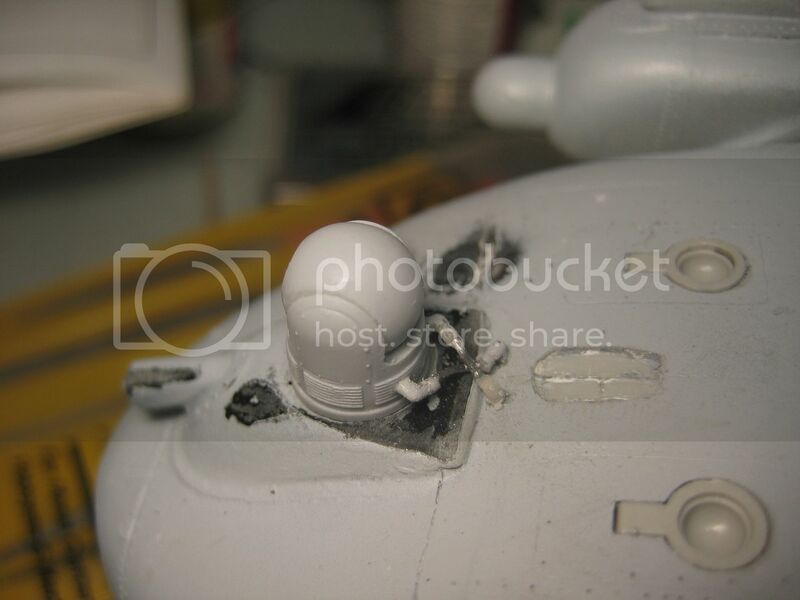 -I would pin the In Flight Refueling boom to make it stronger. 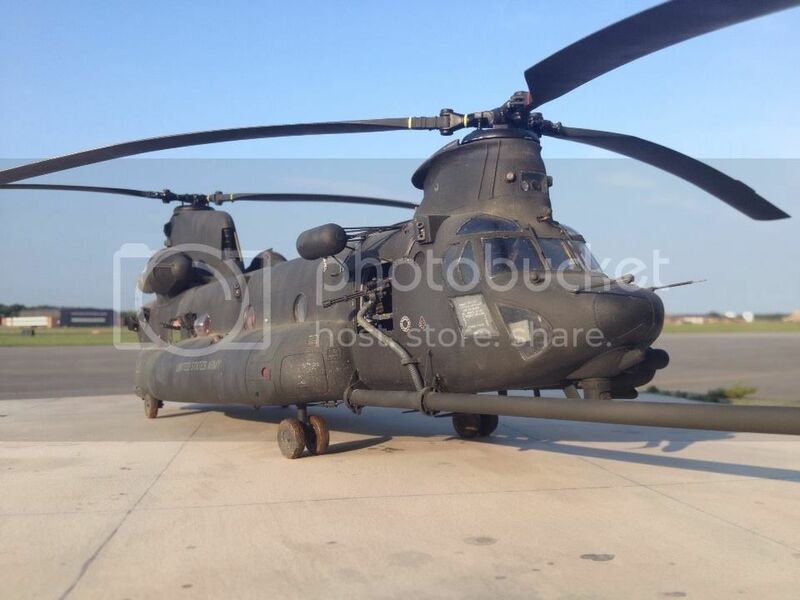 -I would not add the left rectangular window on the MH-47E. I think on a G I would have both of them rectangular, but the E model would not. -I might build the troop seats out of a fabric or tape so I could drape it and make it ‘fabric’ looking. What a great looking process and model Floyd. I'm glad it turned out so well for you. Absolutely fantastic. I hope mine turns out half as good. 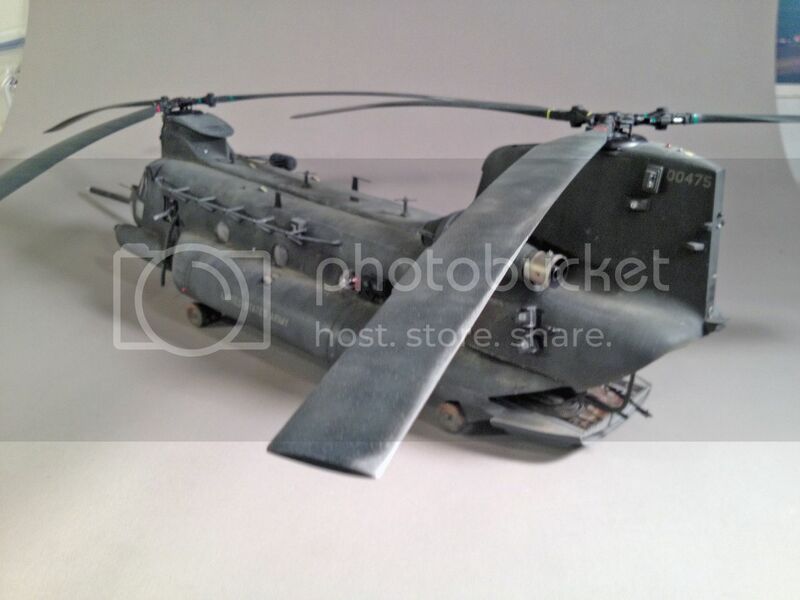 The PDF is up on the Werner's Wings website for how to build the MH-47E. There are tips in there that even those who don't have the kit may find useful. Superb Job !! WOW !! well done !! Amazing job. I dont think I could ever do that. That thing is sick!!! Love it!